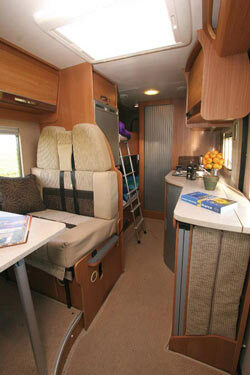 Manufacturer Swift say they are regularly asked for a proper four-berth camper when exhibiting at shows. The Autocruise Quartet is their response to this demand, not that they’re the first in this market. Devon’s Monte Carlo (on Renault Master LWB) has long addressed this issue, while Wildax have been marketing a bunk bed van conversion for some time now. But it was Auto-Sleepers who brought the idea to the mainstream with their Windrush – clearly, the new Quartet will not have things all its own way. But then neither is the Quartet simply a Windrush reinvented in Autocruise décor. While the Auto-Sleeper has four individual seats up front and its bunk beds across the width of the vehicle, Quartet goes for a half-dinette seating area (like the Alto and Accent) and lengthways beds for the kids. One of the key design factors in the Quartet’s layout was the desire to make it possible to load bulky gear through the rear doors. And another useful advantage is the possibility of speccing a (£2995) base vehicle upgrade to Fiat’s new 148bhp engine and Comfort-Matic semi-auto gearbox (the Windrush is manual only). As standard, the Quartet comes on a silver or blue metallic Peugeot Boxer with the 130bhp 2.2HDi Euro V engine, though our prototype wore Fiat badges. Opt for the £1395 Comfort Pack, though, and you still get a high spec – including cab air-con, cruise control, alarm, reversing sensors (essential as there’s no through vision at all), Bluetooth, iPod connection, front foglights and the new factory-fitted ‘wood’ dash trim. From our point of view it would be well worth investing in an alarm and making sure it’s part of a Thatcham Category 1 approved system; in fact at this motorhome value of over £40,000, it would be a motorhome insurance security requirement under Caravan Guard’s policy. Perhaps the most important aspect here, though, is the sleeping arrangements. The top bunk is quite confined but will be fine for smaller children, who are kept safely in their sleeping bag by a substantial ledge. The lower bunk feels much more spacious – plenty big enough for an average adult, in fact. Surprisingly, there are no curtains for these beds, but they do each have their own light, and an opening window in the rear offside door provides ventilation. 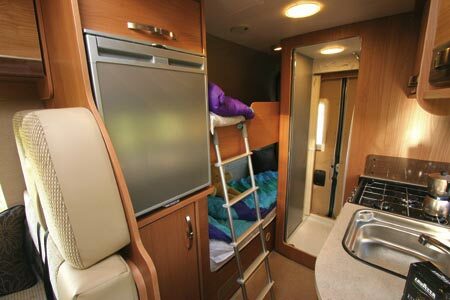 The parental bed up front is quite complex in its make-up from the half-dinette seat, plus a large folded cushion and frame that store under the forward end of the kitchen worktop. Indeed, the unique procedure is shown in a six step illustrated leaflet that comes with the ’van. Obviously, there are compromises in squeezing four berths into a standard long-wheelbase panel van, but the galley doesn’t appear to be one of them. 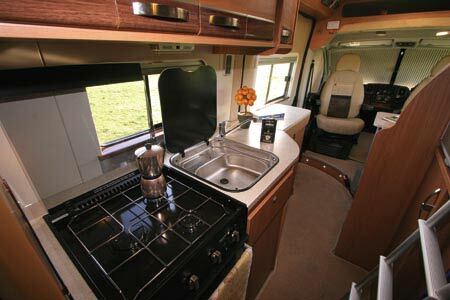 The worktop over the storage for the extra bits of bed means that you are certainly not short of preparation space, and while there’s no draining board, you do get a three-burner hob and a combined oven/grill. The compressor-type fridge (opposite the hob) not only has a decent 80-litre capacity, but is mounted above the small wardrobe for ultra-convenient access to your milk and white wine. There’s a reasonable amount of kitchen cupboard space, too, and cutlery drawer and plate racks are present and correct. 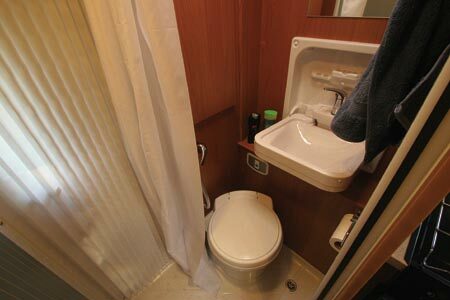 In the washroom you’ll find a swivel cassette toilet and decent space to shower. With its clever design and good value for money, the Quartet is an interesting arrival for family motorhomers wanting to down-size. 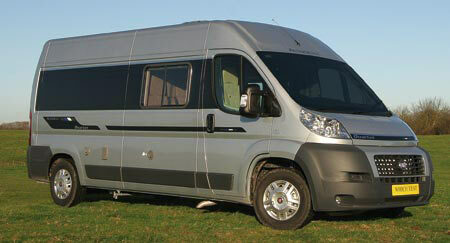 * Motorhome insurance based on 2012 Autocruise Quartet valued at £43,530. Fitted with Manufacturer’s Immobiliser system and Cat 1 Alarm. Kept on driveway at home at TD9 8ED. Insured & spouse, 57 years old, professionals, with no claims, convictions or health conditions in last 3 years. 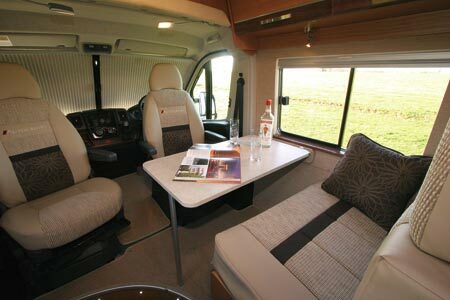 5 years transferred protected NCD, 5 years motorhome driving experience. Members of motorhome club doing less than 5000 miles annually. £300 excess applies. European cover £18.00 extra. European Breakdown £43 extra. Premium includes Insurance Premium Tax (IPT) at 6% and is correct as of 14.02.12.
good pictures, good review, many thanks.